If you are considering replacing a vanity or bathroom countertops in the Houston area, we offer an excellent selection of products that can be installed as both standalone projects or as part of larger bath remodels. We have four distinct lines of cabinetry, including everything from basic workhorse cabinets to designer custom options, and can pair these cabinets with a quartz, granite, stone resin, solid surface, or custom glass countertop, as well as virtually any bowl style imaginable. Of late, we have seen an increased number of requests for vessel bowls with wall-mounted faucets, and this popular design certainly makes for a great looking update. 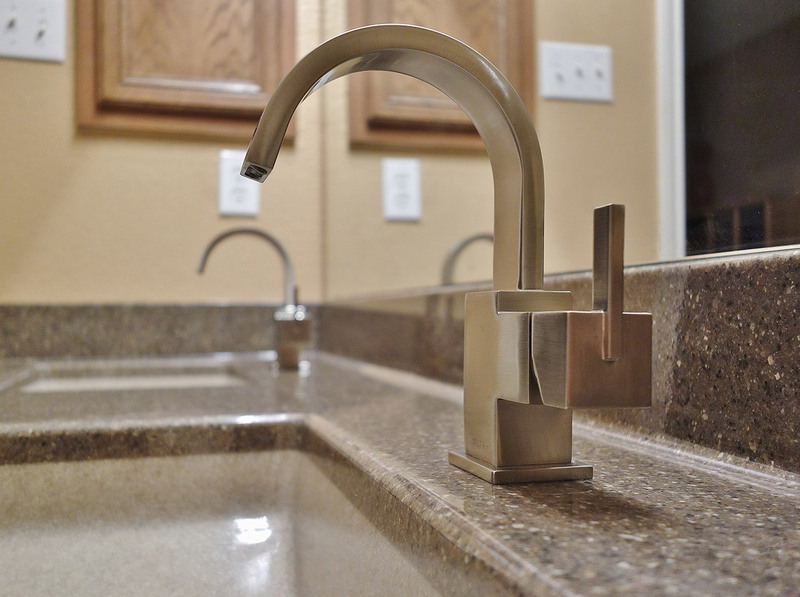 Our sink faucet choices include widespread, centerset, single-hole, and wall-mount options from manufacturers such as Delta, Kohler, and Kallista. We have a full range of styles, materials, and product choices within each category, including four lines of cabinetry and four types of vanity tops – stone resin, solid surface, quartz, and glass. The vast majority of our vanities, vanity tops, and sink faucets are Made in the USA. All are shipped directly to our facility in Houston, so we can inspect them for damage prior to installation.